February has come and gone, and that means it’s time for another episode of GME! Anime Fun Time. This time, join Paul, Tom, and special guest David Cabrera of Kawaiiko-chan!! Gaming no Korner as they lament their wasted childhoods spent playing Sega hardware consoles and explore the wacky comedy, Hi-sCool! Seha Girls, in which various pieces of Sega hardware are personified as cute little moe girls having dumb adventures in the worlds of Sega video games. CLICK HERE or on the image above to download our review. 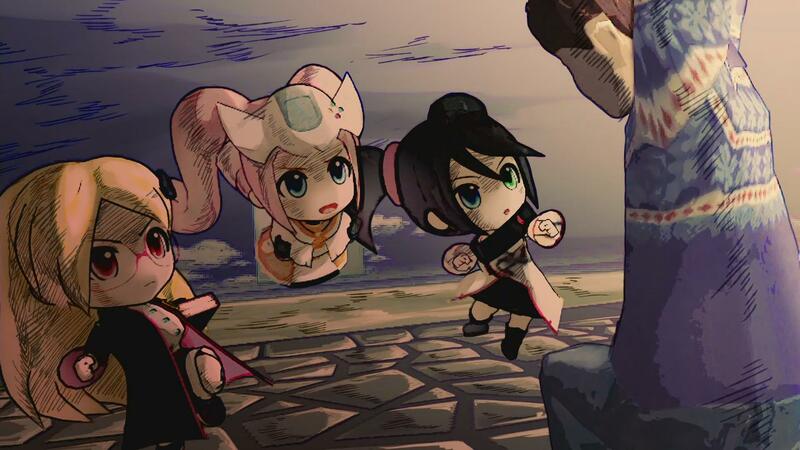 The Seha Girls’ hard battle blazes onward to Eternity. Another anime I’ve never seen or heard of! I was three episodes in when I gave that opinion. I guess I have no need to watch this then. I personally haven’t been a Sega fan myself, though Sega was something I knew otherwise because my sis or brother had the Genesis in the early 90’s while I toiled away on the NES, so occasionally I played the one or two games for it they had (we only ever rented titles when convenient). I sorta digged the SNES more myself if only for the ‘pretty colors’ and that Mode 7 crap. I once had a Dreamcast, bought it used a decade back with some games (including both English and Japanese versions of Shenmue), never did much with it and eventually sold it off again. I did however come across a Saturn in my midst that I just had to take home (it was thrown out for the garbage to pick up. Came with an arcade-style joystick but I don’t think I have the wires to it at all and I don’t know if it even works, so that’s going to take some time before I get around to seeing what I could do with it (pay some guy to check it out and such). I’m sure I’ll get it to work somehow though I’m sure it’ll be a pain picking up those games. It’s true Sonic fandom and reputation is completely different on both sides of the Pacific. While I suppose he’s still seen as a kids’ thing in Japan, it’s taken on a completely different beast in North America and the West, namely the terrible fans themselves who see the games and the characters as they want them to be. And if they don’t get their way, this happens! This is why you need to learn you have a life beyond Sonic! Sad not to see any Segata Sanshiro in this. They missed out! Now I want an anime about Bolex cameras turned into Moe blobs next! Having listened to AWO’s take on the show, they also suggested the thought that someone at Sega saw what they were doing in the first couple episodes and got cold feet over seeing them rip Sonic to shreds so they had to clamp down on that from then on.